It’s this light brown color. I think it might be wax. The transfer is kinda faint and there is a bit of surface noise. I guess this was early on and they haven’t worked out all the kinks yet.. I bought one of these same advertising cylinders back in the 1990's. I was so happy to finally own ANY copy of the cylinder...and then I played it. I was so disappointed with the weak sound and surface noise that I didn't even play it all the way through. I put it back in the box and have never played it again. I immediately thought to myself, "well there's another purchase blunder I made". Every time I look at that cylinder today I'm compelled to toss it out but then I remember that I paid a premium price for it (can't recall how much but it wasn't cheap) so it remains a shelf queen. It's possible that mine was simply a poor transfer and some copies are better. I can only speak for mine. Several years later I was fortunate to find an original Edison Advertising Record in a large group of cylinders I purchased. Now that was exciting and it was very enjoyable too! Oh well. I’ll chalk it up as a learning experience. Still a collectors item because these were the first new cylinders made after many decades of inactivity. 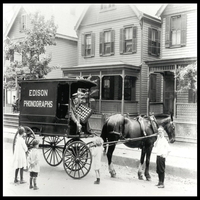 Duncan from Vulcan Records.com has been selling them (Edison Advertising Record by Len Spencer)for at least the last 7 years.. They are all made out of Modern Resin, Practically Bulletproof, and very reasonably priced. PS: I just saw that he is "Out of Stock" of them... I am more than sure that he will make more...but don't know when.. I also have a copy of The Advertising Record from Vulcan. It is a nicely done recording with plenty of volume.